Welcome to the four hundred and fifty-second of my blog interviews with novelists, poets, short story authors, biographers, agents, publishers and more. Today’s is with science fiction / fantasy author Bob Horbaczewski. A list of interviewees (blogged and scheduled) can be found here. If you like what you read, please do go and investigate further. Bob: My name is Bob Horbaczewski and I currently live in Surprise, Arizona. I’m a passionate fan of Science Fiction and Fantasy, and have been so since my earliest memories. I remember at the age of four watching a bootleg copy of Empire Strikes Back that my parents provided at my older brother’s elementary school and being instantly drawn in. I have always loved writing. In sixth grade I attempted to pen my first novel, but the combination of my family moving from Hawaii to Arizona and other childish pursuits drew my attention away from completing it. At the age of twenty my parents went through a divorce and I consequently dropped out of college a semester away from graduation to help my mother through the process. It was at that time that I evaluated what I wanted to do with my life. Together with a group of friends and fledgling actors I was able to write and direct my own independent film, ‘Into The Darkness’, which can be seen on YouTube. Though that project was not a financial success, it cemented the fact in my mind that I wanted to create for a living. After that project I began writing my current novel, ‘The Malef Chronicles’ and I am now trying to find an audience for it. Morgen: I hope this audience (of c.200+ a day) helps. 🙂 What genre do you generally write and have you considered other genres? Bob: I lean toward writing in the science fiction / fantasy genre, mainly because I have such a love for the stories produced within it. Also, I love the dynamic in which that particular genre allows a character to experience growth. Paul Atreides facing his destiny as a Messiah, Aragorn accepting his lineage and leading the Dead Men of Dunharrow into battle, or a young moisture farmer finding out he is one of the last of a group of Mystics. These grandiose situations can push a character in ways that real life drama could not. Morgen: Isn’t that the great thing about fiction; that whilst still be believable, we can do what we like to our characters. What have you had published to-date? Bob: ‘The Malef Chronicles’ is my first novel. Morgen: How exciting. 🙂 You’re self-published, as am I, what lead to you going your own way? Bob: One of the main factors that contributed to my choice to self-publish was creative control. Though I know that the help afforded by a publisher through distribution channels and marketing would greatly accelerate my book into the hands of readers, I do not know exactly if that would truly be ‘MY’ book. In self-publishing I control the end product and what ends up in the reader’s hands is completely my vision alone. Morgen: That’s a big reason why I did the same as you, and self-published (via the eBook route). Is your book available as an eBook? How involved were you in that process? Do you read eBooks or is it paper all the way? Bob: My book is available as an eBook currently on the kindle store. I was completely involved in the formatting process, which I was able to do after following steps online. I do read eBooks, but also paper as well. I enjoy the concept of being able to take my library with me anywhere and look forward to the further expansion of the eBook format to create an even more immersive experience for the reader. Morgen: And knowing technology, it’ll only get more so. Do you have a favourite of your characters? If your book were to be made into a film, who would you have as the leading actor/s? 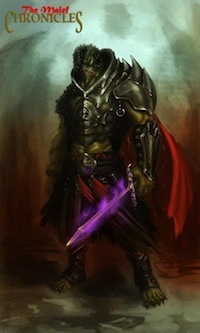 Bob: My favorite character in my book is definitely the villain, Lord Xyrus. I have always felt that the most compelling stories are ones in which the villains have as much depth and strength to their character as the hero. A protagonist cannot truly grow without a serious threat for them to overcome. If my book were made into a movie I would want someone like Tom Hardy to play the role of Xyrus. Morgen: Absolutely, there has to be a dilemma in any story. And great choice of actor. 🙂 Regarding titles and covers of books, how important do you think they are? Bob: I think that the cover is very important to a book as it is the first thing to try to draw the reader in, especially in this day of online media with so many titles available, a quality cover and title can draw a potential reader to click on your book and explore it further. Morgen: And hopefully buy. 🙂 What are you working on at the moment / next? Bob: Currently I am working on two books as well as a couple of screenplays. One of the books is the next volume of ‘The Malef Chronicles’. The other is an action / thriller about a female assassin which ties into one of the screenplays I am working on. Morgen: I like the sound of her. 🙂 Do you manage to write every day? Do you ever suffer from writer’s block? Bob: I wish I could say I write every day, but usually my days are spent managing my two children. I currently work nights at a hospital, so I try to find time to write every night while working. When I get to the editing process of my stories I then usually cannot put my pen down and find whatever spare time I can to finish that. Writer’s block has never been my problem, but rather I usually suffer from Writer’s sloth. It is so easy to lose myself to shows, the Internet, or other random distractions rather than simply put pen to paper. Morgen: “Writer’s sloth”, I love it. 🙂 Do you plot your stories or do you just get an idea and run with it? Bob: I prefer to have a general skeleton for my stories before I start writing them. As I write I will reference back to that, but the actual scenes that I write I tend to let happen naturally. I try to envision a scene in my head and then transcribe that as best as possible. For this current series, in 2007 I came up with an overall structure for the story that would span over the course of nine books. In that skeleton I have the things that I view as important plot points or significant events in the story’s timeline. As I wrote the first novel, I tweaked certain parts to that timeline to create a better dramatic plot line in this novel that will pay out more so later in the series. Morgen: That sounds like a good plan. We’ve touched on a couple of your characters, do you have a method for creating them and what do you think makes them believable? Bob: I do not have a specific method for creating characters. I think the most crucial part to creating characters is knowing their back story. As an author you control the world, but to get the reader to buy into that world your characters need to have a consistent nature in how they react to situations. Just like with people in real life, those characters experiences are the things that are going to shape who they are, and thus how they react and eventually how they grow or fail. Morgen: One of the exercises I set in my Monday night writing group exercises is to fill in a character profile (with name, age, nationality, height, job, hair colour, quirk etc) and apart from being fun to do, they do create aspects that may not have otherwise occurred to us. Do you do a lot of editing or do you find that as time goes on your writing is more fully-formed? Bob: I do not edit until I am completely finished with a story, as I easily become obsessed with rewriting, restructuring the story, and eventually lose my creative drive. Morgen: That’s probably a good idea. I tend to do the same, especially with longer pieces, and even type ‘MORE HERE’ if I get stuck on a particular point and want to move on. Do you have to do much research? Bob: I do enjoy doing research, but I do not obsess with it. My focus in writing is the story and the adventure, so I usually only do research to make sure that my writing is not going to pull the reader away from that suspension of disbelief. Morgen: That’s what we all want to avoid… anything that stops them ‘page turning’. 🙂 What point of view do you find most to your liking: first person or third person? Have you ever tried second person? Bob: I primarily write in third person because I like being able to tell the story from every character’s point of view. I have tried writing stories in first person occasionally, and I think that style can create an intimacy with a main character. I have never tried second person and do not know that I ever will. Morgen: That would be a shame (I love it) but probably wise for longer pieces. Do you write any poetry, non-fiction or short stories? Bob: I have written a few short stories just to spark the creative process, but never tried to tackle nonfiction. Poetry is a great outlet for me when my emotions are either extremely high or low. I love poetry as a way to expel those feelings from my mind so that they do not consume me. Bob: I do not know if I would ever publish any of my poetry, as they are more therapeutic than meant for an audience. Morgen: I feel pretty much the same about mine, with only a poem on the blog’s My Writing page (I was tempted to put something on the Post-Weekend Poetry page but have resisted thus far). Have you had any rejections? If so, how do you deal with them? Bob: I have had a large amount of rejections concerning this current novel, both from agents and publishers. At first I took that rejection and tried to move past it, but the frustration created a very dark cloud over my mood. It was upon hearing Scott Sigler on the Nerdist podcast address the very same issue of rejection that I was able to regroup. He talked about the industry as whole and its inability to take risks anymore. Publishers are no longer willing to spend unless they know they will receive a return on that investment, reducing their risk, so authors are now in charge of vetting themselves before they can gain that acceptance. Though I think that mentality has stifled the creative spirit in the entertainment industry as a whole, I think the Internet is allowing for a creative response toward that commercialism of art. Morgen: I think it was Scott who podcasted the chapters of his novel, building up an audience who went on to buy his book when he published it. I do a podcast so that concept’s still rattling around in my brain. Do you enter competitions? Are there any you could recommend? Bob: I have entered a few competitions, but the lack of feedback on submissions has pushed me away from wanting to continue to pursue that avenue. Morgen: It’s very much a black hole… unless you’re place. Do you have an agent? Do you think they’re vital to an author’s success? Bob: I do not have an agent, and though I think that they can greatly help an author in finding success I do not think they are a requirement. An agent simply accelerates the entire process. I think in today’s day and age an author has many other outlets in which to find an audience and it is simply a matter of hard work and perseverance that will see anyone a level of success. Morgen: Absolutely. Some agents are becoming publishers so that speaks volumes. How much of the marketing do you do for your published works or indeed for yourself as a ‘brand’? Bob: I am currently trying to do much more marketing for my book. I hope to have merchandise available soon to entice people to read the story that those products represent. I also plan on offering my book as a free audio podcast to further draw people into the characters and story I have created. Gaining an audience is my ultimate goal; to be able to give people an outlet to escape into a world of my creation. Morgen: Merchandise, wow. I’d love to see those – I could add a photo here when they’re out. 🙂 What’s your favourite / least favourite aspect of your writing life? Bob: My favorite aspect of writing is the creation process itself. I constantly have stories and ideas racing through my mind. Getting to put them onto paper and give them a tangible existence is the greatest relief to me. Bob: Write because you love to write. If you hope to have riches and fame then you should put the pen and paper down and hit the casino because you have a better chance of finding those things there. If creating is your passion then no matter what comes of your process you will find success and satisfaction of crafting your stories. Everyone can write, but not everyone can be a writer. Morgen: True. It’s like any other craft (painting, playing the piano, even driving) it takes practice. If you could invite three people from any era to dinner, who would you choose and what would you cook (or hide the takeaway containers)? Bob: I would invite Mark Twain, Thomas Jefferson, and Plato. I would cook a simple meal, New York steak, garlic mashed potatoes, steamed broccoli, and some fresh sourdough rolls. It would be amazing to pick those men’s minds. Morgen: Mark Twain’s attributed to so many quotes, I’d certainly want to be there for his. 🙂 Is there a word, phrase or quote you like? Bob: To know nothing is to know everything. Bob: I love sports, but my main time consuming activity is keeping after my two kids. Bob: Strunk and White’s ‘Elements of Style’. I think I should give it a once over more often, but it is a great starting point for writers. Morgen: And a highly-recommended book. Are you on any forums or networking sites? If so, how valuable do you find them? Bob: I am not currently, but hope to start a more prominent online presence within the next few months. I think social media is the future for authors and their ability to connect with new fans. Morgen: I’d agree, so I’m on pretty much everything that’s going (and boy, how time-consuming is it?). Bob: I think the industry is due for a shake up. I think that more authors will be able to directly publish their own work away from the creative stranglehold of the current industry. I think soon enough the eBook format will become a more diverse platform in which to tell stories, and I think it will be a reinvention of the creative aspect of the art that will push in a new era of modern story telling. Morgen: More and more authors are saying their eBooks are outselling other formats, it definitely seems to be where we’re heading (hoorah!). Where can we find out about you and your writing, Bob? Bob: www.facebook.com/themalefchronicles, twitter.com/malefchronicles or @malefchronicles. The Malef Chronicles available on amazon.com or amazon.co.uk. Bob: Keep a look out for KilgorandRoglik’s Dragonblood, a podcast I hope to be releasing on iTunes within the next couple of months. Follow us @kilgorandroglik on twitter. Morgen: How exciting. 🙂 Is there anything you’d like to ask me? Bob: No, thank you for the opportunity of introducing myself and my book to your audience and to you. Morgen: You’re very welcome, thank you for talking with me today. ZOOM! A seasick breezed by Colin, shocking him back to reality. Now the decisive moment had come. To turn back, Colin would face not only embarrassment and shame from his squad, but he would never hear the end of it from Sasha. He could not bear that fate, so out across the deck he walked to the seasick that had so recently buzzed by him. It chirped in response to his presence. “Hey there little buddy,” Colin quipped at the robot, not that it could understand or respond to his comment, but the simple routine helped calm his nerves. Colin removed a magnetic strip from his suit. A crude creation put together in his spare time, this small black strip of silicon and steel was Colin’s ticket to glory. In theory the strip would interfere with the Seasick’s primary functions just enough for him to directly interface and take control of the bot. Sasha had helped him design it, as countless failed attempts to dissuade him from his prior stunts had taught her that it was better to help keep him as safe as possible, than see what damage he would cause if left to his own devices. As with most schemes thought up in the middle of the night, this one sounded worse and worse with each passing moment. Colin reached the seasick. There was no predicting how it would react to him jumping on board, yet alone how its system would react to the interference from the magnetic strip. There was only one-way to find out; Colin leapt. The most agile of leaps it was not, but it was beautiful nonetheless. Colin landed square on the back of the Seasick and made a grotesque thud. The air from his lungs rushed out of his mouth, leaving him mere seconds to regain his composure. The Seasick would be alerting for help at any moment. This was his shining moment and suddenly ego overtook him. Colin’s mind trailed off to the future, of the stories that would be told with such brevity. He looked back at his squad and waved in triumph. Not thinking Colin lost his grip and fumbled the magnetic strip, dropping it to the empty depths of space. All of his glory lost in a heartbeat, in a single act of foolish bravado. In desperation, Colin lunged for the strip. His legs barely hung onto the side of the Seasick as the strip floated further and further away, gone forever. The Seasick’s alarm wailed. His failure was now complete. In the distant future, Colin Kinison, a brash, young and arrogant pilot is thrust into the middle of an impeding galactic war after his ship is suddenly attacked while investigating an unusual anomaly at the edge of known space. O’Tel, king of the Ter’Ok’Zhu, an ancient race of mystics, recruits Colin to help him stop Xyrus, Dark Lord of the Belgae, from assassinating a once thought lost Princess. A tale of swordplay and space fights, bringing together fantasy and science fiction, The Malef Chronicles offers an epic journey into the fantastic. A child of the 80s, Bob Horbaczewski grew up immersed in both Science Fiction and Fantasy. Inspired at a young age to write, Bob found a passion in story telling and was rarely found without a pen and pad to write with. Lost to the wonders of Star Wars, Star Trek, Lord of the Rings, Dune, Dungeons and Dragons, Marvel, DC, and numerous other stories, Bob became determined to craft his own tales. In every spare moment of his life, Bob found time to write. However, in the summer of 2006 one idea began to consume his creative process. Born years earlier in a wild hailstorm of thought, The Malef Chronicles found a pressure to be brought to a more refined form. Years prior Bob had dreamed of crafting an epic nine part story of galactic wars, betrayals, love, death, and wonder and in 2006 he finally took the steps to begin that very story. Great, inspiring interview. Thanks for the inspiration. Thank you, RJ. I’ll let Bob know you enjoyed it. Awesome interview and I also loved how the interview in places worked both ways, a discussion of what it is to write and the different ways of doing things. Really clever. I could relate completely to the rejection issue. It doesn’t do much for confidence and inspiration but it’s always so important to remember that you’re not alone and it’s certainly part of the process for pretty much everyone. It’s always reassuring to hear authors talk openly on this painful and difficult issue. Thanks very much for the read, really enjoyed it. Yay. Wonderful, thank you Tony. I’ve added the links to .com and .co.uk.